There’s a group of writers from Solstice Publishing who are in a blog tour and they’re a daring bunch because they asked me to contribute a piece – and this is it. This is the question Mrs Nelder stabbed me with when she once peeped over my shoulder at my list of story rejections being three times longer than the acceptances. Answer: I didn’t know I was okay at writing until a teacher made me stand in front of the class and stumble through an essay I’d scribbled. A silly tale about a red squirrel scrambling on the gnarled boughs of the village’s oldest oak tree, stealing an acorn from a tree spirit to bury under a pupil’s desk. Imagine my surprise when every kid sneaked a peep under their desk. And saw many selles and selcouthe thynges. 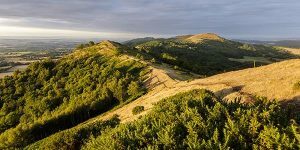 I learnt it by heart, while hiking on those actual Malvern Hills, a short bike ride from my house. I took my son on those hills a few years ago and the ‘sonne’ softly warmed our backs. I learnt the energy in words of sensual Show. Engaging the reader via all their five senses in every story. I read the great writers and they all do it. Even those science fiction and thriller books that the literati often overlook. Consider these two words from Kurt Vonnegut’s Cat’s Cradle: ‘She gave him a perfumed hug.’ You know which two words. Did you experience that hug? You were there, right? After graduating, twice, I taught high school where writing lies takes over. Not really, but all teachers have to write masses of words. We talk about a target of 2000 words a day on our novels but teachers often achieve that when writing lesson notes, worksheets and above all, end-of-term reports. Most teachers hate that but writerly ones love it. It gives us the opportunity to be creative with an otherwise tedious activity. (assuming the school isn’t using computerized multi-guess reporting). One of my favourites: ‘The dawn of legibility in John’s writing revealed his utter incapacity to spell.’ Such chores honed my writing decades ago. I remain fascinated enough by gnarled oak trees and squirrels to write them into my stories. This 2017 year sees publication of my ‘Girl in a Wandering Wood’ in The Horror Zine. I’d overheard the phrase wandering wood and thought what if a wood actually wandered? So, a botanist is trapped in a copse, animated by a spirit trying to stop her escaping. A squirrel helps her out, kind of. The same squirrel I wrote about in 1957. A sample flash story. First published in Bobbing Around: (2004)Vol 3 No.6 A newsletter by psychiatrist Dr Bob Rich. He should take advantage of the perspective from the top floor of a bus. Forrister’s car lingered in Foley’s Vehicular Care Centre for its annual medical but he had to put in a work appearance. Green vinyl seats as opposed to his red leather but not bad. His nose expected sour milk odours—a foolish bias, so his eyebrows arched with surprise as fresh air slapped his face from the open top windows. Even so, those reasons for individual travel, cocooned in his Ford, came to him—personal space, sublime solitude listening to opera. He sought the least offensive fellow traveller. The beard looked normal enough: its owner gazing through a demisted circle on the window as London glided past. An uncomfortable moment passed as Forrister obliged the window-side occupant to move a corner of his coat and shuffle up. In his car, Forrister would by now have tuned in to Classic FM talking back, unheard, to the presenter, so he turned to his companion. No response. Could be his new friend had defective hearing but more likely incredulous anyone had the temerity to strike up a conversation. Twenty minutes before disembarking—he had to give it another shot. “For—is that all?” Beard conversed all right but in gibberish and to the window. Suddenly, Forrister’s head received a blow from behind as a robust woman thrust her elbow over the seat. She treated Forrister to a cloud of gardenia fragrance. “Grooten?” She barked. Beard turned, looked at her and nodded. What? He hadn’t appreciated the rapidity of language development since he last used public transport. Contorted out of recognition. Forrister couldn’t participate. The woman had slumped back into her seat and the beard brushed again at the condensation. Forrister had to try again. “Full today then,” Forrister said, sketching a wave at the one empty seat. Before the Beard could reply, the elbow dented Forrister’s head again. “Grooten?” she asked. He shook. She re-slumped. Dejected, Forrister re-bagged the orange, stood and weaved his way to the winding stairs, three stops early. Before the descent he glanced back. The woman took Forrister’s seat. Beard took an ear-piece out of his left ear. Geoff Nelder is a professional liar, badass editor, and fiction competition judge. 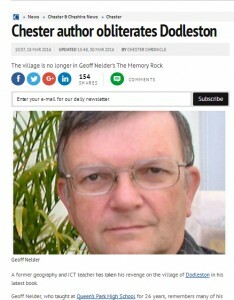 He was awarded Fellow of the Royal Meteorological Society for his research into air pollution and microclimates and used his students as unpaid researchers to discover urban heat islands in Yorkshire towns and villages. He taught now-out-of-date Geography and IT to the ungrateful alive but escaped on his bike to write. His publications include science fiction novels Exit, Pursued by Bee and the ARIA trilogy; and thrillers: Escaping Reality, and Hot Air. Many of his short stories have found homes in mags such as The Horror Zine, Perihelion, Ether Books, Encounters, Jimston Journal, Delivered, Screaming Dreams and many anthologies such as Monk Punk, Science Fiction Writers’ Sampler (with Gregory Benford and David Brin), Twisted Tails, and Zombified. His non-fiction include books on climate and he co-wrote How to Win Short Story Competitions. 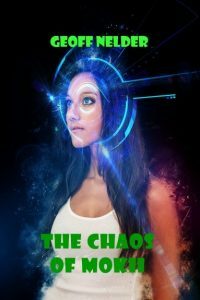 Latest is an experimental science fiction short story, The Chaos of Mokii, published as an ebook by Solstice Publishing at http://mybook.to/ChaosOM It’s only a half-hour read yet will change every train journey you’ll make. Where can we buy the books? How can we follow you on Facebook? Are there any other sites we should know about? That’s it, thanks for reaching this far, if you did. May the rest of your life be deliriously wicked in the best possible way. The post Nelder on a blog tour appeared first on Geoff Nelder - Science Fiction Writer. Give me the sodden British countryside any day.